AffComm would like to have a custom contact form to handle new user group applications. 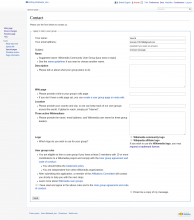 They would like to have this form available on metawiki before 2015-05-01. @Slaporte has a mockup of the desired form. @Slaporte could you upload the mockup on Phabricator and then add it to this task? @bd808: Are you intending to assign this to yourself, or should we be handling it with the other config change requests? Getting the wiki page that I took the mock screen shot from moved to a non-private wiki would be optimal so that the desired messages are cut-n-paste friendly rather than needing to be retyped by a developer. @Slaporte can you be responsible for doing that and then linking the wiki page here on the task? I think we can do most of this. HTMLForm does like to make things awkward though. The terms and conditions checkbox will probably have to be squashed over to the right. We can probably fix or hack around all of these. Create a new class which inherits from HTMLRadioField to override formatOptions and append the extra text to the end. Create a new class which inherits from HTMLCheckField returning '' for getInputHTML and parent::getInputHTML( '' ) for getLabel. Can probably turn those simple array additions into array_merges? Also not sure about the "Email me a copy of my message" box at the bottom right. @Slaporte? Would it be helpful if I showed what I already have? Hi @Krenair, thanks for working on this! It's OK to keep "your name" and "your address" options. I would prefer if the subject was pre-filled or not customizable at all. Ideally, the subject would be: "User group request: $name." Is that possible? This is OK if it looks good. The Terms and Conditions checkbox should be mandatory, too. Is that possible? Can probably turn those simple array additions into array_merges? Also not sure about the "Email me a copy of my message" box at the bottom right. @Slaporte? We can keep the "email me a copy" option. Would it be helpful if I showed what I already have? Yes, I would like to see the working version. Thanks again! is what I have so far. Ignore these parts, see the later comments I made where I had worked out how to workaround the issues. I think it's possible to make the terms and conditions checkbox required. Can we add a small consistent margin between each row of inputs and labels, on the top or bottom? I also see that the first few labels (Your name, your email address, subject) are not bold like the rest. Also, can we use the nice styled buttons? I am not sure how consistently they are used in the MW interface. Krenair closed subtask T96087: ContactPage can't handle label-raw fields during form submission as Resolved. I also see that the first few labels (Your name, your email address, subject) are not bold like the rest. This part is fixed in my working version now. Can we add a small consistent margin between each row of inputs and labels, on the top or bottom? Also, can we use the nice styled buttons? I am not sure how consistently they are used in the MW interface. @Slaporte: The first thing is probably something you can try with CSS when it goes up. The second thing... We can probably add that in as a hack if you really want it... Might be easier with extra custom CSS. We could do it directly in the extension for all the forms. Should be easy enough since it's using HTMLForm. @Slaporte: What user do we want these to send to? I setup an account: User:Usergroups to receive this form. Thanks! In future it's probably a better idea to create the account while logged in... Anyway I made a tiny user page for it and updated the config change commit. We should try to make sure https://gerrit.wikimedia.org/r/204203 gets approved before 2015-04-22 (i.e. before 1.26wmf3 branching). After that I think we can deploy https://gerrit.wikimedia.org/r/204205 on 2015-04-28 evening (i.e. after 1.26wmf23 goes to metawiki). or not perhaps since it's a community-run committee? Although I'd usually deploy these changes, I've asked @bd808 to step in and make sure it gets done due to the need to start focusing on my exams rather than Wikimedia things. Stealing this from @Krenair after he's done all the hard work so I don't forget to do the deploy once 1.26wmf3 is live on metawiki. The patch in https://gerrit.wikimedia.org/r/204205 needs the noc symlink fixed. It also needs a guard in EmailUserForm hook to make sure it is dealing with the correct form. Reverted shortly after deploy. Will investigate a fix and try again. Revert "Revert "Add AffCom user group application contact page on meta""
In addition to the issue with the email actually being sent, a user will need to set up the CSS and ensure that the links actually point to valid pages. These aren't sysadmin tasks. @bd808, I adjusted the list settings to accept emails from the form. I'm going to try and come up with a reasonable way to include that CSS via ResourceLoader but if that falls through we can just get the global CSS edited. 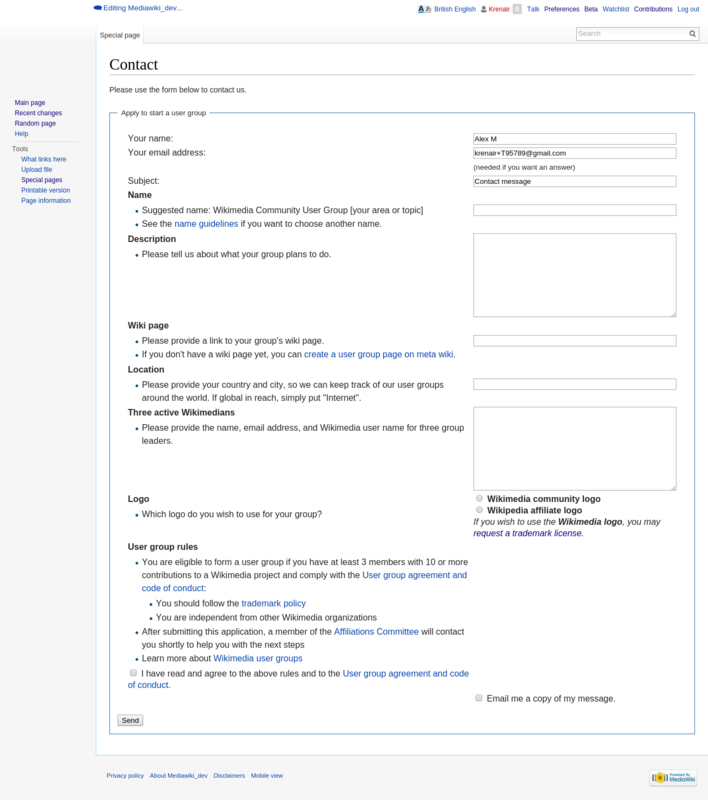 bd808 mentioned this in rEWMEb975bc5fb925: More ContactPage messages for affcom user group form. The patches are now in review that will stick the CSS into the WikimediaMessages extension so that no on-wiki changes are needed to support the pretty contact form. 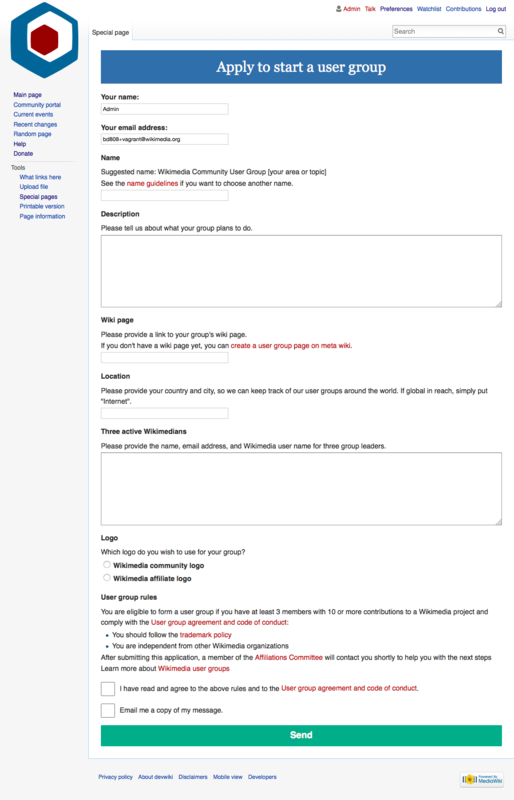 When they are merged I will need to backport the latest ContactPage and WikimediaMessages extensions to 1.26wmf4 which will go live on metawiki on 2015-05-05. At that point we can apply the config changes to setup the form and make it live. bd808 mentioned this in rMEXT316fced560a7: Updated mediawiki/extensions Project: mediawiki/extensions/ContactPage…. Enabling patches are all merged now. Backports of ContactPage and WikimediaMessages extensions to 1.26wmf4 need to be prepared and scheduled for a deploy window next week. This will require a full scap, so it needs a distinct window rather than riding with SWAT. bd808 mentioned this in rEWMEf778899121e0: Add RL module for [[:meta:Special:Contact/affcomusergroup]]. The backport to 1.26wmf4 has been pushed to the WMF production cluster. Tomorrow (2015-05-05) the 1.26wmf4 branch will go live on metawiki. I've scheduled the config patch to create the form there to go out in the evening SWAT window following the version bump.